This exercise is very similar to the previous but it is using a prop to ensure proper alignment and to give an added challenge to the peroneal muscles and tendons on the lateral side of the ankle. This exercise is great for ankle strength, and can add balance to the ankle that tends to roll through the fourth and fifth toe as opposed to the second and third toes. 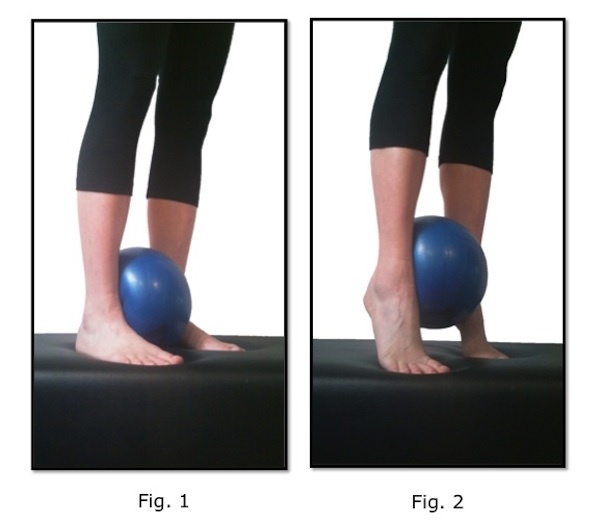 To do this exercise start by standing on both feet with a soft ball between the medial malleolus of each ankle. Be sure that the weight is distributed equally on both feet. Then as you exhale press the balls of your feet into the ground as you rise onto your toes. Inhale as you slowly lower your heel to the ground, and then exhale as you rise on your toes again. Repeat 8-10 times. Posture, Posture, Posture – As you’re exhaling imagine your head floating to the ceiling. As in everything the longer you feel in your spine, the safer your joints will be. Also, like all of these ankle exercises, the weight of your foot should move over your second and third toes to prevent ankle strain and bone deformation in the toes.